Businesses are witnessing a huge downfall hiring a wrong candidate. No business owner wants to hire the wrong person for a job. A bad hire not only drains energy and time, they can also cost a business in a number of ways. Reference check is one of the most important aspects of the selection process. Reference check lets you find the most qualified candidate who is also a perfect match for the designation. This check allows you to determine if the candidate is suitable for the particular role or not. A reference check will help you gain great insights about the candidate’s adroitness, knowledge and abilities. 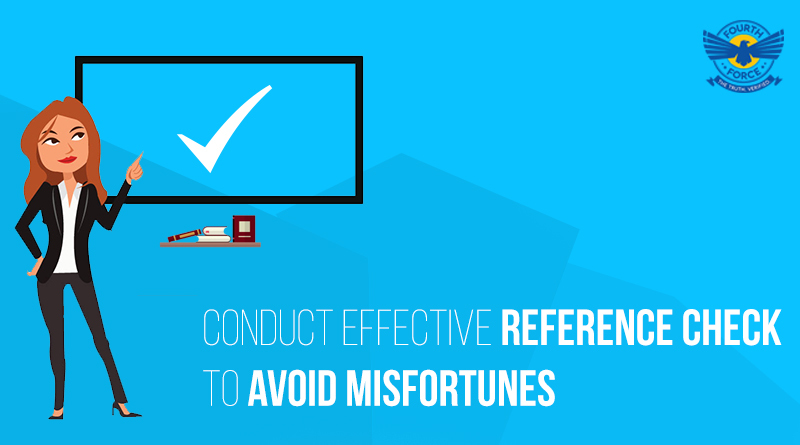 So, ensure you conduct an effective reference check before you make a job offer. • Talk to someone who previously worked with the candidate to learn about their work habits. Based on these pointers try to evaluate your candidate. By conducting reference checks, you can avoid costs associated with candidate’s failed probation periods and poor performance. Fourth Force delivers value to Clients by providing reliable verification services with engaged employees and expertise to mitigate risks in a cost-effective way. Though there are several background verification companies in India, Fourth Force stands out from the rest. Fourth Force has a team of 100+ disciplined, reliable staffs, which includes dedicated high profile professionals with several years of experience in sectors like CBI, Police and RAW. With more than 4000+ man hours of skill, they can definitely help you bring changes to your business. Fourth Force offers an extensive range of verification services for corporate. They also offer background checks that cover external corporate resources like vendors and distributors, and domestic services resources like maids and drivers. As professionals with a sound understanding of the latest regulations, you can be sure that what they do and how they do it is secure and compliant. Whatever the nature, size and depth of your hiring program, you can count on Fourth Force’s extensive range of verification services, and our capabilities and competencies, to get the job done.